The installation of Georgia Civil War Heritage Trails® roadway "trailblazer" directional signs are nearing completion along three different “historic driving routes”…the Atlanta Campaign, March to the Sea (both the “Left Wing” and “Right Wing” routes) and Jefferson Davis Heritage Trails. Each trail leads motorists along many of the exact same roads once traveled on by marching armies and/or historic individuals on horseback. 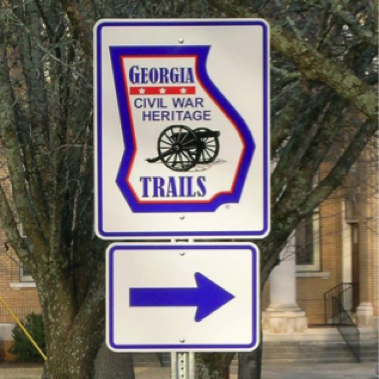 The installation of colorful and informative Georgia Civil War Heritage Trails® roadway “trailblazer” directional signs are nearing completion along three different “historic driving routes”…the Atlanta Campaign, March to the Sea (both the “Left Wing” and “Right Wing” routes) and Jefferson Davis Heritage Trails. Each trail leads motorists along many of the exact same roads once traveled on by marching armies and/or historic individuals on horseback. The historic driving route portion of the Jefferson Davis Heritage Trail is virtually complete, with only a few individual “trailblazer” sign locations yet to be installed. A colorful brochure guide for the public is currently in development, including a detailed map showing this trail’s route heading generally south from the Savannah River near Elberton and Lincolnton (“red star” on map) through the historic towns of Warrenton, Sandersville, Dublin, Abbeville, Fitzgerald and others before reaching the site of Jefferson Davis’s capture near Irwinville. 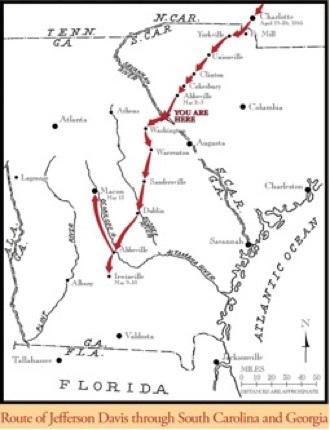 From there this trail turns generally north through Abbeville (again) Hawkinsville and Warner Robins before reaching Macon where Davis was taken to meet with Union Major General James H. Wilson.